There have been a couple of interesting pieces of news about Seaside in the last few days. Sebastiane Sastre and colleagues at flowingconcept.com have brought their new airflowing.com application out of private beta, and are now accepting new commercial subscriptions. Airflowing is an online tool for managing your creative business, including contacts, tasks and finances. It’s designed to be a quick-start tool aimed at people “who need to get things done and get paid” and is already in use in 35 companies. Under the skin it’s based on Smalltalk and Seaside so scaling the application up to meet new customer demand should be no challenge for the team! Find out more about this release and the hard work behind it at the flowingconcept blog, and try a trial subscription at airflowing.com. At the other end of the scale, Lukas Renggli highlighted a post by Pavel Krivanek to the Seaside mailing list. 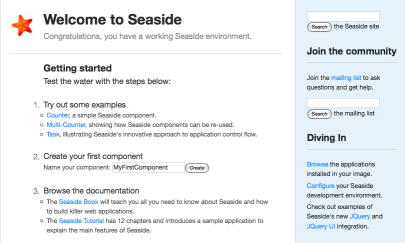 Pavel has managed to build a working Seaside image weighing in at under 5MB. The image includes the Zinc web server, and is based on a stripped-down Pharo-kernel image. As well as build instructions, Pavel has made a pre-built image available, so check it out!